And you know what? IT TOTALLY IS. People found this image amusing and endearing, as evidenced by the number of "likes" this image had. I think maybe it's one of those ironic things. 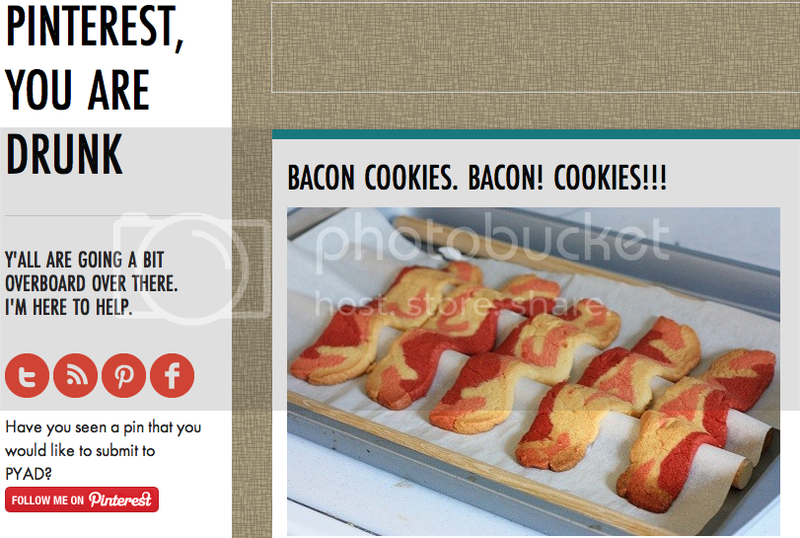 Like, if a larger person were to say "I love bacon," I feel like we would respond, "Um, yeah ya do. Might want to love it a little less there, big guy..." Because it's the opposite of ironic. But if a skinny hipster or pretty girl with a sense of humor talks about how much they love (local, grass-fed) bacon, everyone chuckles and agrees wholeheartedly. I'm not saying this is a bad thing, or even a good thing. I'm just saying it's a thing. Maybe our society just collectively voted in bacon as the official national food of America. Bacon isn't gross enough to be publicly condemned, but bad enough for you that it's still American. It's affordable to the masses. People put it on everything, including ice cream (lookin' at you, Burger King). It's the perfect fit. Ron Swanson may also have had something to do with this. I can't be sure, but I know how he loves his breakfast food and slabs of meat. People tend to listen to him. 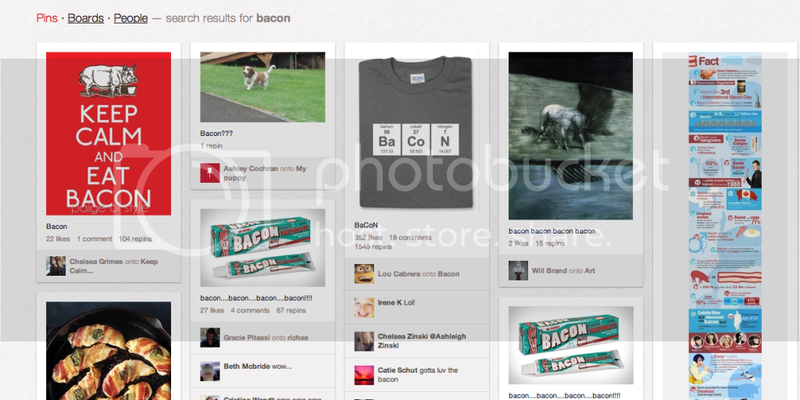 Below is what happens when you just search "Bacon" on pinterest. T-shirts, fun facts about bacon, bacon flavored novelty toothpaste...it's all there. DARE I say Bacon is the new Mustache? It might be too soon to tell, but ol' Mustache better sleep with one eye open. Even kids know it. I was reading Mandie Marie's delightful blog a while ago, where she often posts "field notes," which are basically just funny things her kiddos said when she substitute taught their class. Guess what made more than one appearance? BACON. Me: Can you tell me some healthy things to eat? C: Bacon. Me: Bacon is delicious, but it’s not healthy for you. C: GASP (I’m telling you, there was an audible gasp and his mouth hung wiiiiide open). Me: I know buddy. I’m sorry I had to break it to you. Me: Can you name a healthy food? E: Bacon! Me: Sorry guys, although delicious it’s not healthy. E: Is there sugar in it? Me: No, lots of fat. E: But… Me: I know buddy. I know. Me: Tell me something awesome. A: Bacon. Me: You are not the first person to have said this. In conclusion, Bacon really IS the new black. Try to argue with kindergarteners about it. You won't win. Have you noticed this trend? On a scale of 1 to 10, how much do you love bacon?